In Bengal, Diwali is celebrated as Kali Puja, the day that the goddess Kali is worshipped. Kali is hideously ugly and terrifying to look at - but only because she is so angry at the wickedness in this world. Kali is the destroyer of all evil, and is worshipped as such on Kali puja. Long long ago, the world was overrun with evil - men had turned to wicked ways, and demons, rakshasas and ogres thrived and prospered. The gods were helpless. They could do nothing to control or contain the evil in the world. In desperation they turned to the supreme goddess Devi for help. Devi agreed to end the evil, and took on the black and frightening form of the goddess of destruction to do so. This form of Devi is known as Kali, which means 'black'. Devi in the form of Kali then went on a rampage of destruction, killing and destroying all the evil men and demons in the world. Kali became so angry that she could not stop, even when all the evil had been destroyed. She began destroying the entire world in her fury. The gods asked her to stop, but she didn't hear them. They turned to Shiv her husband for help as the only one who could stop her. But Kali didn't hear him either. So Shiv lay down in her path - and only when she put her foot on him did she come to her senses, and stop her madness of destruction. Kali is worshipped in her destructive mode. She is terrifying to look at, black and furious, with four hands, dripping blood and dressed in skulls. 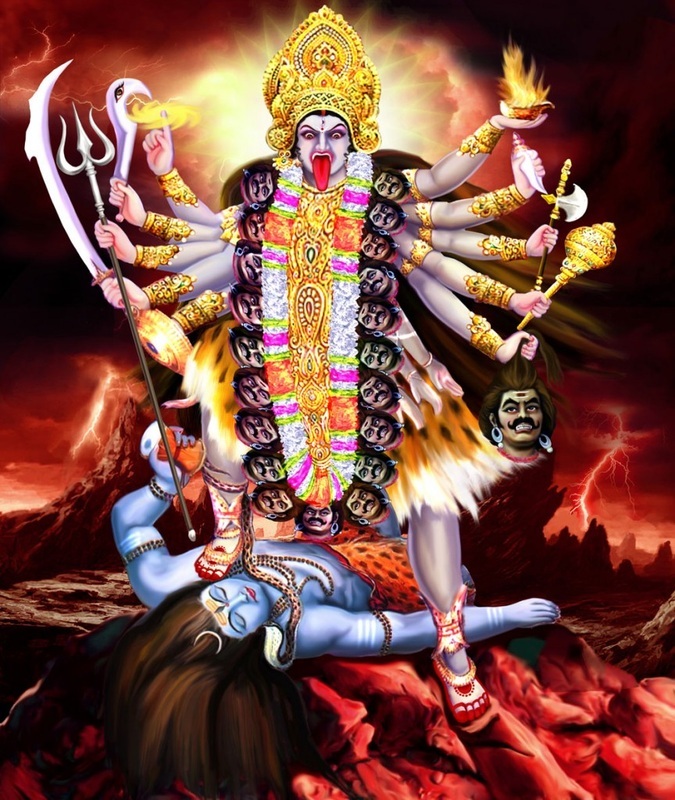 She is shown with one foot on Shiv who lies prone in her path, and with her tongue sticking out in shock and horror as she realises the destruction she is causing. There are twelve most holy Sivalingas known as Jyotir-Lingas, the manifestations of Siva in the form of emblems representing light. In the Dakshineswar temple also, twelve temples of Siva have been constructed in a row by Rani Rasmani, who perhaps had in mind the twelve Jyotirlingas. Sri Ramakrishna himself was a living Jyotirlinga of Siva as he was the embodiment of divine light which arose out of Jugi's Siva Temple of Kamarpukur. Thus it is no wonder that Thakur was much devoted to the twelve 'Jyotir Lingas' or Siva installed at Dakshineswar. Sri Ramakrishna could not worship for long the twelve Sivalingas in the Dakshineswar temple which are called Yogeswar, Jatneswar, Jatileswar, Nakuleswar, Nakeswar, Nirjareswar, Nareswar, Nandiswar, Nageswar, Jagadiswar, Jaleswar and Yajneswar. Among these twe1ve Sivas, Jagadiswar (literally, Lord of the world) seems to be especially important, as the real name of the Kali at the Dakshineswar temple is 'Sri Sri Jagadiswari Mahakali.' Sri Ramakrishna himself was Jagadiswar-Siva who actually realised that the Jagad (world) itself is Iswara (Siva). He said "One day while worshipping Siva I was about to place a betle- leaf on the head of the image, when it was revealed to me that this Virat, this Universe, itself is Siva. After that my worship of Siva through the image came to an end." But he used to send his young disciples to the twelve Siva temples for meditation.